The best of fall produce make wonderful salad ingredients, from fresh fruits like figs, apples, and pears to all the hearty autumn squashes. Tossed with wholesome greens, nutty grains, and tangy cheeses, they form wonderfully healthy and delicious salads that you can serve at holiday parties or enjoy for a lighter lunch or dinner this fall. Here's an essential fall salad that makes a healthy weeknight addition wonderful Thanksgiving side dish. Dried fruit is a pretty and flavorful way to make a green salad extra special—for this one, chopped dried apricots and cherries add a burst of tart sweetness, beautiful color, and lovely chewy texture. Did we mention that it's topped with crumbled cooked bacon and goat cheese? You'll never go wrong adding this pear salad to your fall dinner menu. With fresh fruit slices, chewy raisins, crunchy walnuts, and creamy nuggets of Gorgonzola cheese tossed in a simple lemon and rice vinegar dressing, it's a tasty salad to enjoy as a special first course or served in larger portions for a lighter lunch or dinner. For a kale salad chock full of stunning fall ingredients, look no further than this recipe. Roasted golden beets and golden raisins add a touch of sweetness and chewiness, while the bright tahini-lemon dressing helps tenderize the leafy greens. Roasting cauliflower adds a nice nutty flavor and welcome crispiness to the autumn vegetable. This robust salad combines florets with pomegranate seeds, red onion, pistachios, lemon juice, and fresh parsley for wonderful mix of color, texture, and flavor. Fall is the main season for figs, meaning these delicious fruits are available again for adding pizzazz to our greens. Make the most of fresh figs in this kale salad, which combines the fruit with carrots, zucchini, avocado, and flax seeds. Nutty, protein-rich quinoa is seasoned with fresh mint, parsley, lemon juice, and green onions in a nutritious, low-fat salad that will also appeal to vegetarians and vegans. Pecans are used in the recipe, but almonds or pine nuts would taste great, too. 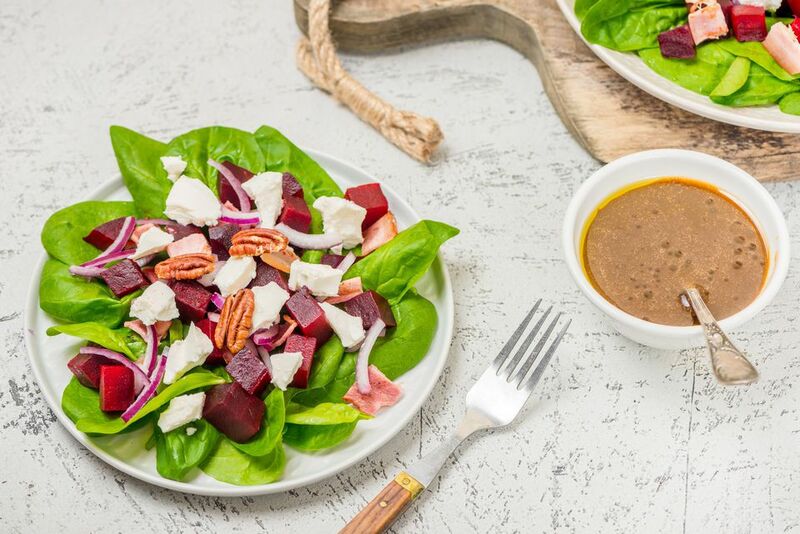 Cooked beets are the colorful base of this tasty fall plate, also featuring crispy diced bacon, fresh spinach leaves, and crunchy pecans or walnuts. Add a soft, mild cheese, such as feta or goat cheese, to form a heartier meal. Here's a satisfying steak salad that feels like a treat to eat and you can make in just 15 minutes. It's also a surprisingly budget-friendly way to stretch one eight-ounce steak into a full meal for two people this fall. The salty-sweet tang of the pickles adds an interesting twist to the dressing in a bowl that's sure to become a family favorite. Fall fruits add delicious flavor and texture to this sophisticated salad. Fresh chopped apples and pears are combined with dried cranberries, blue cheese, walnuts, red onion, and mixed greens. A simple balsamic vinaigrette dressing ties everything together. Chicken and mushrooms are a classic combination and this nourishing meal makes the most of them. A homemade sour cream dressing adds tangy richness to the salad, which would make a great brown bag lunch for work or a satisfying fall meal with a cup of soup on the side. A couscous salad is a versatile, healthy choice that can be easily customized with your favorite chopped fall vegetables. Enjoy it as a side dish for grilled meat, roasted chicken and fried fish—or as a nutritious take-to-work lunch, bulked up with some added greens. Simple, tasty, and healthy—that's this lemony lentil salad. It's a great starting base for dressing up with whatever seasonal fall vegetables strike your fancy at the market. Butternut squash and arugula are fall favorites that combine beautifully with grains and other ingredients. Pomegranate seeds and honey add something special to this vegetarian main dish salad, which also works as an accompaniment to meat, poultry, or fish. 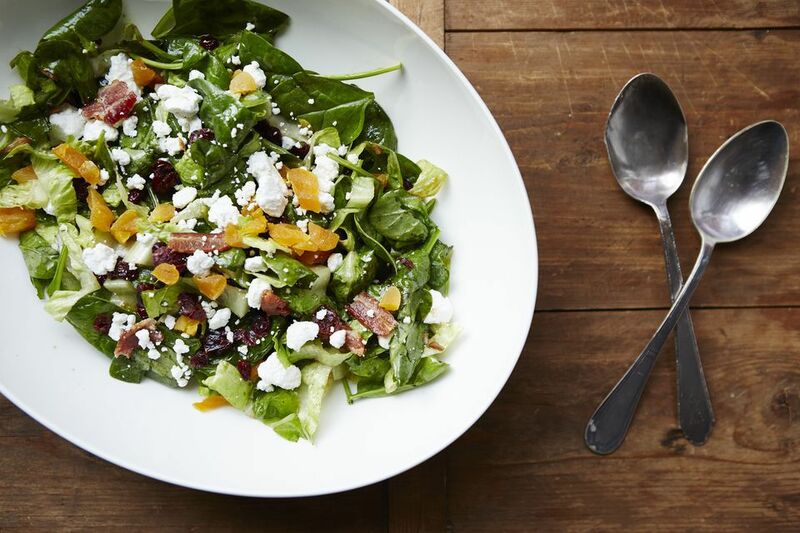 Whether you want to impress dinner guests or just indulge this autumn, our recipe for classic spinach salad with bacon dressing is a fantastic choice. The warm dressing is made with bacon drippings, vinegar, and sugar and wilts the spinach leaves into a warm salad. Crumbled bacon bits and hard-boiled eggs add extra heft. Chicken salad isn't just for summer picnics. The combination of tender chicken, crisp pecans, tart apples, and a creamy honey mustard dressing in this fall rendition is absolutely fantastic. (Using a rotisserie chicken also makes it a snap to assemble.) Just add some dinner rolls on the side and you'll have a fabulous meal with absolutely no cooking at all.